When we talk about abortion providers, stories usually center around the physicians, administrators, staff and volunteers who work directly with patients in the clinic. The abortion experience does not only happen within the walls of a clinic, though. What about the before? Or the after? Our EmpowerLine team is the touchpoint for our patients and their support people in those before, during, and after spaces. Collectively we have over one thousand phone conversations each week with people all across the country regarding waiting periods, insurance and funding options, emotional needs, and more. The EmpowerLine is Whole Woman’s Health values of empowerment and holistic care personified, with a little quirk. 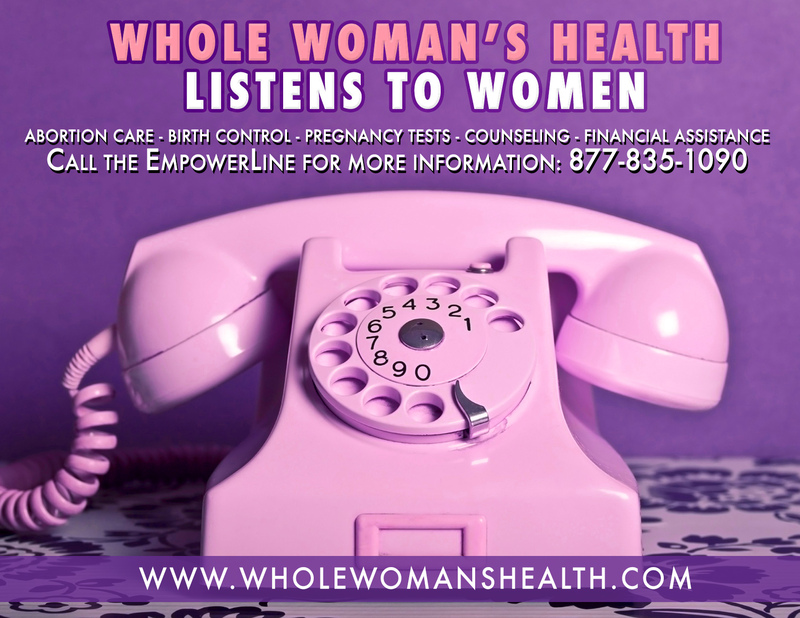 We sat down with Emily, one of our Women’s Health Advocates to talk about working in the EmpowerLine and the role of phone service within the abortion experience. Why work in the EmpowerLine? Is there something to helping people over the phone? I like the EL (EmpowerLine) because we can speak with people across the country with so many different situations. The stigma surrounding abortion makes it so people don’t know what to expect when they come into an abortion clinic. They have this image in their head that isn’t welcoming or good. It’s nice to put their mind at ease, to explain to them what they’ll be experiencing. The more you know about what you’re about to go through, the more relaxed you’ll be. It’s nice to be able to dispel some of the myths that women have about abortions, e.g. not being able to get pregnant again. To be able to answer those concerns and then hear the relief, it’s very powerful. You can come into the clinic and receive support here, and that’s great, but you need to have support before as well. Why should people call the EmpowerLine? The level of advocacy that we have. The funding resources. We really do go above and beyond. For example, if they’re Catholic and having trouble reconciling that we’ll give them the information for Faith Aloud or Catholics for Choice. I like to think of us like a web. We’re more than just a call center because we can talk through feelings, questions, concerns. It’s more than just setting up appointments. It’s beyond that. It’s more holistic. We may be speaking on the phone, but we’re developing personal connections. Often times people will call back multiple times, asking for us by name because we’ve developed those connections. A lot of women will travel from really far away. They can’t come in and have extended counseling, or they don’t have the time etc., not everyone can just come in and take a day off or something to speak to a person. The EmpowerLine is only a phone call away and we always encourage people to call back with questions or concerns no matter how big or small. Women are busy. Sometimes you’re only able to make a phone call and so it’s important that there is someone on the other end who’s really listening. What kinds of conversations stick out in your mind? The most meaningful conversations I have are with the people who have all the myths in their mind. They’ve only heard the anti-choice language, but they find themselves in need of our services. So I get to take the time and explain how abortion actually works – that this is actually a very safe, non-invasive procedure. What changed for you when you started working in abortion care? Before working here I didn’t realize how common [abortion] was. How one out of three women have an abortion in their lifetime. Most are mothers. We see patients who range from being children to their 50s. It’s not just teenagers, or poor people, or single people. I now think about it more as a regular part of women’s healthcare. It’s not this separate, like, fringe thing. It’s a healthcare service like any other. One of the things that makes Whole Woman’s Health unique is our openness and support for people seeking second trimester abortion care.. There are so many different reasons why women have abortions further along in their pregnancies. Because until you hear their stories, you can’t pass judgement. It’s not a ‘oh, I just didn’t get around to it.’ I had one woman who spent months thinking she was going through menopause and it turned out she was pregnant. Or, there was a patient who was assaulted and in a state of shock for so long that she simply didn’t comprehend that she was pregnant. The people who have abortions further in their pregnancy have special situations. And money… the money chase. Sometimes money is the largest barrier between someone and the abortion they need. I like to be able to say that I work at an abortion clinic because abortion is not a dirty word and the more we say it the more it’s less hush hush. It’s not something to be ashamed of. I work here with pride. The more I share my knowledge with other people, the more that conversation happens and the more people get interested and it opens doors to other people. And that’s what needs to happen across the country. Conversations that are being had around abortion. Amy Hagstrom Miller is *so over* abortion stigma, formally launches Shift.